How long and when do you transcribe records in Notes from Nature, and other neat ways to look at your (amazing) effort. Last post, we provided a look at cumulative transcription efforts across our four current projects. These summary numbers hide all kinds of interesting details about how these transcriptions take place and where the data is coming from. Thanks to efforts on the part of guest bloggers Julie Allen (http://wwx.inhs.illinois.edu/directory/show/juliema) and Libby Ellwood (https://www.idigbio.org/content/welcome-libby-ellwood-new-postdoctoral-scholar-idigbio), we have some more in depth statistics to show you. We have also been asking some questions about transcription effort and time put in by all the amazing people who have worked on Notes from Nature. So, simple questions: When do people transcribe records? And how long does it take? 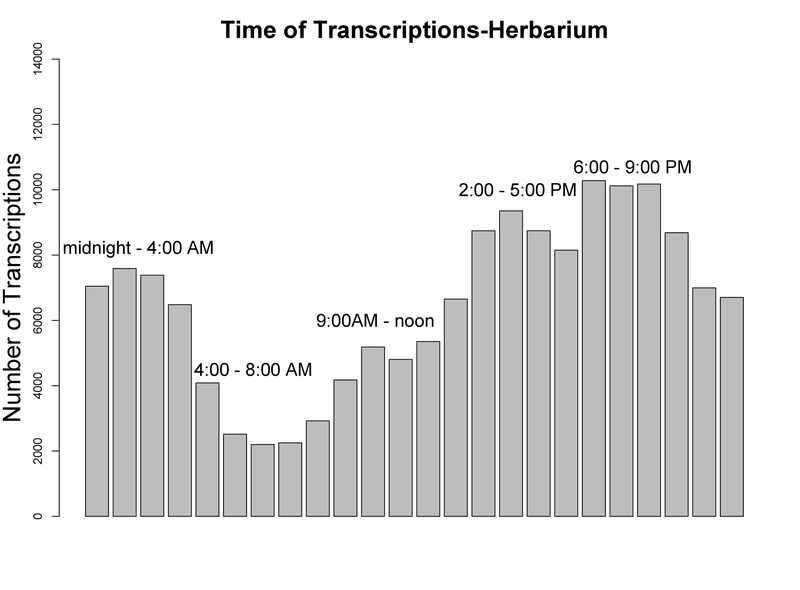 In terms of the “when”, here is a graph of number of transcriptions and when they happen during the day for the Herbarium collection (based on GMT time). Although its hard to know what time zone our transcribers might be in, we see a lot of activity at all hours (even and maybe especially late night) We wish we could provide more coffee for those working late. Not all records are created equal in terms of time needed to transcribe them, and surprisingly not all collections are equal either! We know that some records are harder to transcribe than others but on average it takes 3:05 min for a Herbarium record to be transcribed whereas only 2:16 for Macrofungi and the fastest of all 2:04 for an average CalBug record. There is a lot of variation around those times as you can see from the plot below. Amazingly, there have been 20,761 people helping to transcribe records across the four collections! We find a classic pattern in citizen science transcription projects where the majority of transcriptions have been performed by just a few people, while most folks only contribute briefly (a record or two) and then move on. We’d really like to find a way to engage folks for the long term and change that equation, but as you can see from the graph below, we also have a similar result with a few people doing the lion share of the work, with one person logging an amazing 92,528 transcriptions!! We hope these summaries provide some useful information. We learn a lot from these, all with the goal of hopefully improving how well Notes from Nature can work in the future. We have some neat ideas about those improvements and hopefully will be sharing some of those improvements just as soon as they are ready. If you want to see the code that generated these results, we’ve posted it to github (https://github.com/juliema/NfN_DataParsing) and will make some of the results data available soon too. Great post, I always wondered how many transcriptions made country wise, I must say I was a bit disappointed when I saw my country, Bosnia and Herzegovina is blank and I alone made 415 transcriptions ( Herbarium – 95,Calbug – 311, Ornithological -3 and Macrofungi – 6). I hope this will be solved becouse I would like to see how many transcriptions my country mates have done since I did a little of spreading the word on popular forums. Ammar, we feel similarly to you. One thing we would like to accomplish (but it is a longer-term kind of challenge) is to give you the ability to find those specimen records that are in your country (or of the greatest interest to you). We’d like to take some ideas about how to do that and make that happen, and we’ll keep you posted about that over the next weeks and months. We should be more clear! I’ll edit the post asap because it’s confusing as writte. Ok updated to be more clear! Thanks Ammar! Thanks for the information. It’s been a few months since I’ve been here. After I reached my goal of 1000 transcriptions, I moved on to other citizen science projects. It’s nice, now, revisiting the site, to read these recent blog posts. I have just started transcribing for the ornithological project (having started with the insects, and doing genealogy transcriptions for FreeBMD almost 10 years – makes a change!). I have a degree in biological sciences so it makes a nice change. Interested (and holding out for) improvements that allow the copying of details from one record the next as that will make things a lot easier. Charlotte — THANKS for helping out on Notes from Nature! We really appreciate the effort. And yes, we are really hoping to having what we call the “ditto” function up soon — that would allow you to access the last five entries for quicker transcription. Thank you for your reply – I look forward to what is proposed. How are such updates implemented and notified? We’ll most likely use the blog to announce those features. If possible, we may also try to call it out via some hopefully unobtrusive pop-up that shows up when you enter a collection and start transcribing. Is there a problem with the site at the moment? The link I had saved to get to the input template leads to a dead end. One other thing – some of my pages haven’t been completed – I have pressed a wrong key or something and they have disappeared, to present me with a new page. Is there somewhere I can go to retrieve them and finish them? More in my early attempts but I had a couple of ones earlier today – most frustrating. Also – is it possible to “park” them somewhere and come back to them as each page takes quite some time to do? This is particularly the case if one is researching details such as correct spellings, geographical details, etc. We have some bigger ideas here, and just submitted a grant that includes MUCH better ability to find and track the images you want to work on, including those that on which you have started work. Its a bigger fix given how the system is currently set up but its one we know is important, and if we do get some funding, a priority change. What’s happened to Notes from nature? When I click on the links I have used up to Saturday (NZT, GMT+12) I hit a blank page with nothing on it! We had a small glitch this weekend and apologies for that. Small glitch with an update that killed our main page for a while. All fixed now! PHEW!